On behalf of the Jewish Community of Thessaloniki, we would like to express our sorrow and sincere condolences on the passing of Lo Tishkach founder and board member, Rabbi Aba Dunner, Zecher Tzadik Livracha. May God rest his soul and offer comfort to his family and friends in this time of grief. On behalf of the NIK – Organization of Jewish Communities in The Netherlands, please receive our sincere feelings of sorrow for the passing of our dear friend Rabbi Aba Dunner Z”L. May he be taken on the heavens wings. May European Jewry merit of his Zchus. Hw ill be remembered as the driving force that has firmly put the Orthodox Rabbinate on the map of Europe, and indeed he has succeeded. We have put an article (in Dutch) to eulogize him on our website, which will be published in the NIW Jewish weekly, too. With deepest condolences to his wife and children, may they receive the comfort of HKB”H. 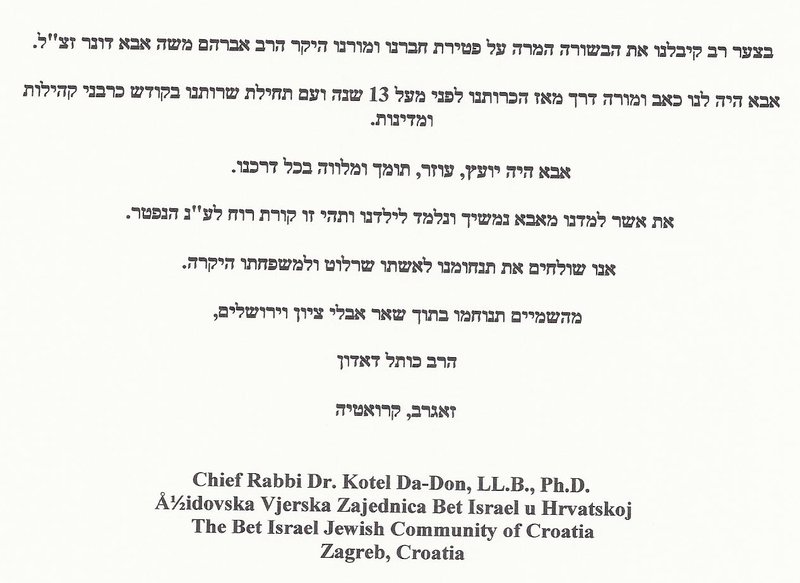 The Federation of Jewish Communities in Serbia sends its deep condolences to family of Rabbi Aba Dunner. The Jewish World lost an extraordinary person and activist. We will cherish the memory of his unique personality and warm kindness. The news hit us here in Malta as a shock. Rabbi Abba Dunner who had the talent of making every one he talked to feel so important and at the moment of approaching him he made everyone searching his help feel welcome and wanted. He was so busy and he took on more and more both individual and community problems and he really helped or put one in touch with those who can help. He changed ones world by moving us so much closer to HAKadosh Baruch Who, with G-d directing him he solved problems in the four corners of the world. His name was Abba and he “fathered” with kindness, gentleness and empathy. One of the 36 Zadikim who prop up this world He leaves behind the trail of his glowing spirit and a memory that he expected us all to follow his Path Tehiye Nishmato Zerura Bizror Hahayim. May you never know more sorrow. The Jewish Community of Estonia would like to express its heartfelt sympathy on the death of Rabbi Aba Dunner. We share a deep feeling of loss. It is with great sorrow that I receive this message. I had the pleasure to speak and meet Rabbi Dunner several times since I serve in Portugal, and it is indeed a great loss for Am Israel. Please send my best regards to the family and the children.